I feel like I’ve been working incessantly on the blog for the last two weeks and yet have had nothing to post on it! This has been a mixture of disasters learning experiences – Cornish fried ravioli (let’s not even go there!) – AND preparing for my next guest blog at LiveGlutenFree, which should be going live sometime at the end of next week (here’s my last one! ), AND developing my contribution for the upcoming Gluten-Free Recipe Challenge hosted by Caleigh over at GlutenFree[k] (here’s my last one!). Both of these have not been without their problems. My first effort for LiveGlutenFree was a gluten-free version of ‘le pounti’, a speciality of the Auvergne in France, which I can best describe as a cross-between a crustless quiche and a savoury clafoutis: it’s made with smoked bacon (or lardons), ham, onion and Swiss chard or spinach, mixed with a batter and baked in the oven. Sounds pretty good so far, I hear you say. On paper, it was a winner. In reality, it was horrible. The batter had a rather unpleasant soapy texture and there was a noxious reek and aftertaste of still-raw spinach. My husband and I stoically munched our way through our portions and I even managed to sneak a couple of spoonfuls into my toddler. When the meal was over, I wordlessly ushered the rest of it down the food waste disposal chute and we didn’t speak of it again… So, no ‘le pounti’ and it was back to the drawing-board… Do give the LiveGlutenFree blog a visit next week and see what I managed to come up with instead! I made this dish last week with stuff from the fridge and a packet of ready-made gluten-free pasta, when I realised that the meat I had taken out of the freezer hadn’t defrosted in time. It was so good, I decided to do it again, but this time I thought I’d ring the changes by using gnocchi rather than pasta. The sauce is extremely reminiscent of ‘alla carbonara’ although I’m not sure if it’s even remotely authentic. Artichokes are my current favourite vegetable (high in prebiotics!) but, if you’re not keen, I think blanched asparagus spears would work just as well. When gnocchi are done well, they are bee-yute-ee-full. When they’re not, they’re horrendous. In the years BGF, I used to buy them already made and found the taste of flour overpowering. Homemade are soooo much better, and I think particularly so when they’re gluten-free and made with potato starch. They are the lightest and fluffiest gnocchi imaginable and the starch allows the unadulterated taste of the potato to shine through. The consistency of the dough is really important. If it’s too wet, it will disintegrate in the water; too dry and you’ll end up with stodgy, glutinous cannonballs which will lodge in your throat and weigh heavy in your gut. So don’t be too cavalier with the flour – if you add too much, you’re faced with the unenviable choice of either boiling more potatoes to redress the balance or a post-prandial snack of a packet of Rennies. You will also need a potato ricer, mouli-légume or a sieve. Cut the potatoes into 1-2cm pieces. Place in a large pan of cold water and bring to the boil. Boil for 10 minutes, until tender to the point of a knife, and then drain in a colander. Leave in the colander to dry for five minutes, shaking them once after a couple of minutes to enable steam to escape – you want the cut edges of the potato pieces to look floury and fluffy. Don’t leave them any longer than this, as you need them to be warm in order to melt and absorb the butter and egg yolk. Push the potatoes either through a potato ricer or a mouli-légume (or, at a pinch, through a sieve) into a large bowl. This will ensure the lightest, fluffiest gnocchi possible. I really wouldn’t recommend using a masher because it always seems to come out lumpy. Add the butter (or butter substitute) and the egg yolk. Season generously with salt and pepper and mix well to combine. Now stir in about two-thirds of the potato starch. Using your hand, gently bring the mixture together, gradually adding more starch until you have a soft and silky dough. Tip the dough out onto the work surface and gently knead: you shouldn’t need to flour the surface – if you do, your dough is too wet and you need to add more starch. Take a handful of the dough at a time and roll out gently into a snake about 1.5cm thick. Cut into pieces about 2.5 cm long and lay out on a plate. Continue until the dough has been used up. Cover with clingfilm and refrigerate whilst you make the sauce (or at least 15-20 minutes if you’re using a ready-made sauce). Mix the cream, milk, grated cheese and egg yolks in a bowl or jug and season with pepper (you shouldn’t need any salt because of the cheese and bacon) and set aside. Heat the olive oil in a large frying-pan (skillet) or sauté pan over a low flame. Add the chopped onion and cook gently for a couple of minutes. Add the garlic and continue to cook for another couple of minutes until the onions have softened and are translucent. Add the chopped bacon and continue to fry for another five or so minutes. Then add the quartered artichoke hearts to the pan and continue cooking until they are heated through. Switch the heat off. (If you’re cooking this in advance, you can refrigerate this mix at this point until you need it). Put a large pan of salted water on to boil. Take the gnocchi out of the refrigerator and gently press each one of them with the back of the prongs of a fork (I usually do them diagonally because I think they look better!). When the water has come up to the boil, cook the gnocchi in three batches. The gnocchi will sink to the bottom of the pan when they go in the water but they will gradually float to the surface. When they’re all merrily bobbing up and down on the surface, put the timer on for one minute. 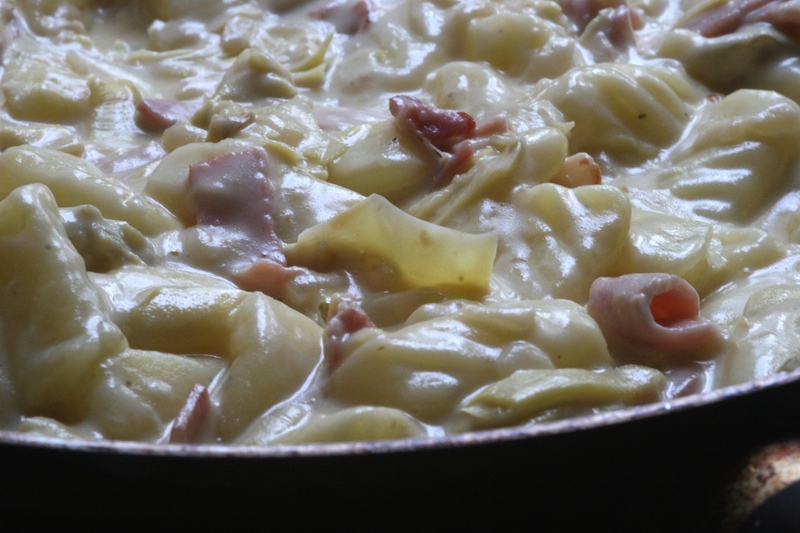 At the end of the minute, scoop them out, using a slotted spoon, into the bacon and artichoke mixture and continue with the next batch. When all the gnocchi are cooked, turn the heat back on under the pan (a low flame again). 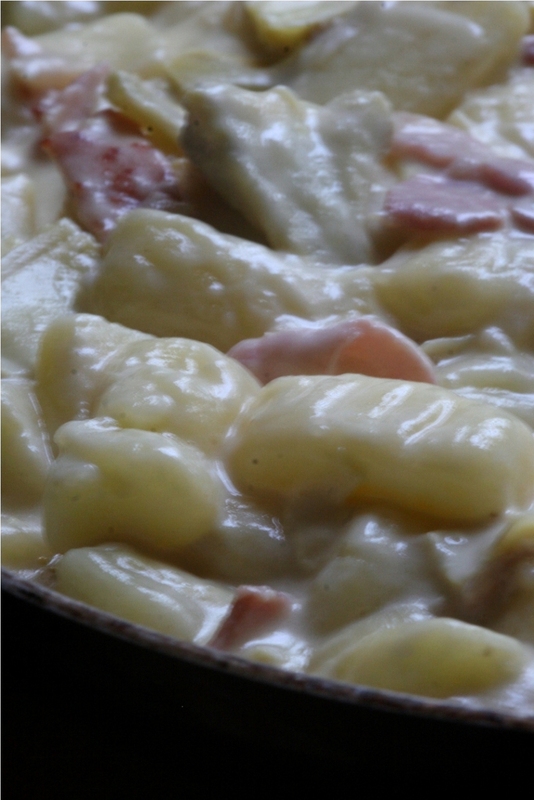 Pour in the cream and egg mixture and stir gently until the gnocchi and bacon are piping hot and the sauce has thickened and is bubbling (about 5 minutes). When is a gluten-free pizza not a gluten-free pizza? When it comes from Domino’s, it seems. (This is in the US. As far as I’m aware, Domino’s UK don’t offer one but I am prepared to stand corrected). The furore over their purveying a gluten-free pizza which is prepared and cooked cheek-by-jowl with their other glutenicious offerings and which, therefore, is as gluten-free as the Pillsbury Doughboy, has lit up the Twittersphere like Piccadilly Circus. On steroids. 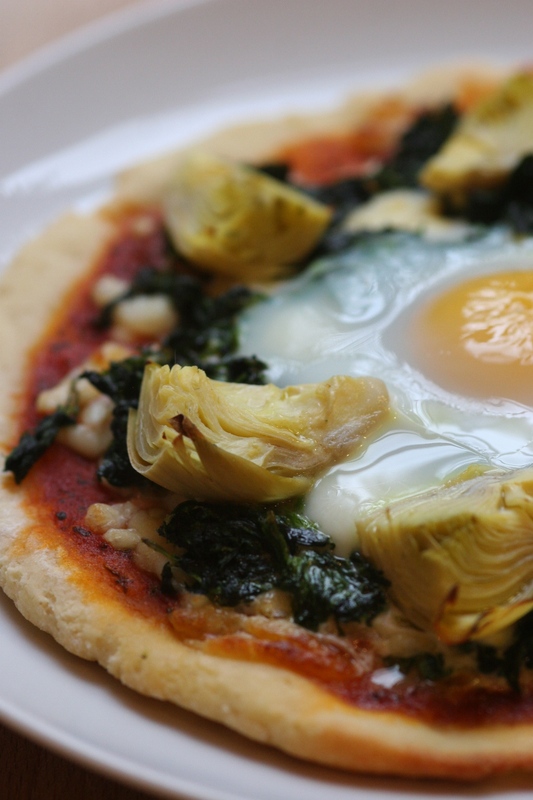 There are any number of reputable restaurants in the UK now offering gluten-free pizzas but, if you’re not in the mood for eating out, why not try one of my ‘Easter Riviera’ pizzas at home? Easter Riviera pies are traditional in the south of France and consist of spinach, artichokes and hard-boiled eggs. When I came across the recipe in Good Food magazine, I immediately knew that it would make a good pizza and that Easter was too long to wait to try it. And I was right. This recipe uses the base of a loose-bottomed cake tin (one with a rim) to aid the rolling out process but it really isn’t necessary if you don’t have one. (One of) the problems with gluten-free dough is that it is very difficult to shape and you often end up with raggedy edges when you’re rolling out. I just fancied having a pizza that was purty and circular for a change, rather than ‘rustic’! It does, however, also help when sizing it to fit in the frying pan. The dough has rather a long rising time for, what seems like, relatively little reward. I dare say that the rising time can be speeded up in a warm place like the airing cupboard if time is of the essence. I made these well ahead of time, so I was more than happy for them to just sit there and do their own thing. I do advise leaving them to rise though. They don’t look like they’ve done a lot but if you press them lightly with your finger, you’ll feel that they have puffed up and the finished article does have a lovely light and crispy texture. I’ve also included the ingredients for my easy-peasy tomato sauce but, of course, feel free to sub your own! Don’t overcook the egg – you want the yolk to still be liquid so that when you burst it, it covers the pizza in all its creamy yumminess. Sift the flours, yeast, caster sugar, baking powder and xanthan gum into a large bowl. Add the salt and stir with a balloon whisk to break up any lumps. Make a well in the centre of the flour and add the beaten egg. In a small microwaveable bowl, lightly beat the milk and yoghurt together and warm in the microwave for about 40 seconds on ‘high’. Add the oil, beat and again and add to the flour and egg. Make your hand into the shape of a claw and gradually incorporate the flour into the liquid by making circular movements with your hand. As the mixture comes together as a sticky dough, start to knead. If it is a bit dry, add a little water, i.e. a tablespoon. As soon as the dough has come together, tip it out onto the work surface and knead for a couple of minutes. Divide the dough into three balls (they should weigh approximately 180g each). Lightly brush the three baking sheets and the cake tin base (rim uppermost) with olive oil. Place one of the balls of dough in the middle of the base and flatten slightly with your hand. Dust the top of the dough with flour and then, using a rolling pin, roll it out so that it fills the base. You might need to coax the dough the last few millimetres to the edge with your fingers. (If you’re not using a cake tin base, just roll out the dough into a rough round, 2-3mm thick). Now either slide or carefully flip the base onto one of the oiled baking sheets****. Repeat with the other two balls of dough. Cover the trays of dough with a tea towel and allow to rise for 3 hours at room temperature. Meanwhile, get the topping ready. Squeeze as much of the water out of the defrosted spinach as you can and chop it finely. Heat up the olive spread or butter in a small frying pan (skillet). When it has melted, add the spinach and the crushed garlic and cook gently for 3 or 4 minutes. Turn the heat off and allow the spinach mixture to cool. In a bowl, mix together the tomato passata, sundried tomato paste, dried basil and garlic granules. Set aside. At the end of the rising time, preheat the oven to 190°C (my oven is fan-assisted). Heat a little olive oil in a large frying pan (skillet) over a medium heat. When hot, slide or reverse flip (as above) one of the bases into the hot oil. Spoon a third of the tomato mixture onto the top of the base and spread to within about a centimetre of the edge. Cook for several minutes until the base is golden brown and slightly blistered. Slide the base back onto the baking sheet. Repeat with the other two bases. Scatter a third of the mozzarella over the tomato sauce on each pizza. Then, scatter a third of the garlicky spinach, leaving the centre clear. 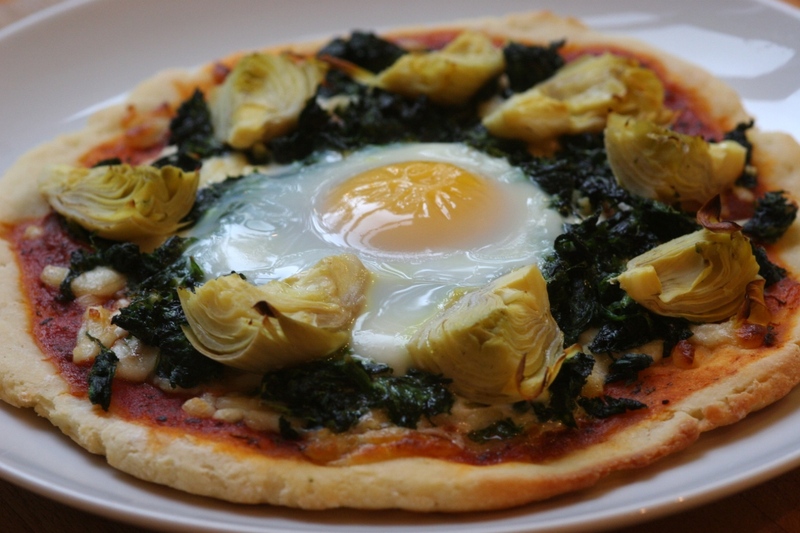 Arrange a third of the quartered artichoke hearts around the edge each pizza and finally break an egg into the centre. Bake in the oven for 10-12 minutes or until the egg white is just losing its translucency and is still slightly wobbly. * I find the whole potato flour/potato starch thing confusing. I’ve read lots of American recipes that state that potato starch and potato flour are not the same thing. I’m wondering if, in the UK at least, they are. For the purposes of clarity, I use the Community Foods brand which is readily available at Tesco which says ‘Potato Flour (Potato Starch)‘ on the front of the packet and ‘Potato Starch’ on the back. ** I’m not sure what this equates to in fresh spinach – I tend to use frozen because I never need a whole bag and end up with a slimy green mess in the bottom of my fridge. *** Pre-grated mozzarella tends to be coated with an anti-caking agent which may, or may not, be gluten-free. I use Tesco’s own brand which uses potato starch. ****I found a delicate flipping technique worked, where I inverted the base over my spread hand and allowed the dough to slide off onto it before flipping it back onto the baking sheet. See what’s inspiring me on Pinterest! Because there's more than one way to make a cake.